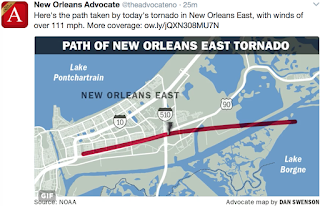 MSE Creative Consulting Blog: New Orleans: "Your Forecasts Were Spot-On"
"Spot on." Those are words that every meteorologist wants to hear, especially when they apply to a storm like the one that devastated New Orleans yesterday. Before going any farther, I wish to congratulate the National Weather Service (NWS) on its warning of the storm. The NWS's job is to warn the public-at-large of dangerous storms and they did that yesterday. The result: No deaths. AccuWeather Enterprise Solutions provides precision warnings as needed by specific business and enterprise clients. Our clients told us we did an outstanding job, including the "spot-on" comment by Norris Yarbrough, Asst. Vice President of Emergency Services and Preparedness for Tulane University. We provided warnings for their three campuses, including the Tulane Medical Center, along with multiple telephone briefings while the crisis unfolded. 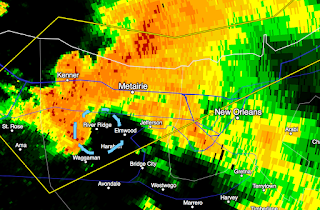 Rotation developing west of New Orleans yesterday morning. There are those that misunderstand what AccuWeather Enterprise Solutions does: Unlike others, we do not repackage NWS warnings. We create our own using our unique technology and highly qualified meteorologists certified to provide warning services to our clientele. For example: We issued our first tornado warning for New Orleans at 10:28am. We told our clients we were expecting the tornado to develop between 10:40 and 11:30am CST. The reason for issuing the warning before it goes into effect is to allow our clients to know how much time they have to prepare for the storm. The NWS's tornado warning was issued 24 minutes after ours and, like all of their warnings, went into effect immediately. None of this is to criticize the NWS. Our missions differ. Some of our clients tell us they need extra time to prepare for these storms. So, hats off to the amazing team at AccuWeather Enterprise Solutions. And, if you business is affected by weather, call us today!